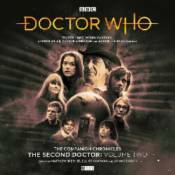 Starring Anneke Wills as Polly, Frazer Hines as the second Doctor, and Louise Jameson as Leela. Zoltan Clarkson had a dream of a domestic dinosaur in every home. Now Clarkson lies insensate in the infirmary, his twin brother Andrew struggles to hold things together, and dinosaurs walk the Earth. With the Doctor and Ben chasing monsters at sea, Polly has only a socially awkward scientist and the world's friendliest dog to help her prevent the rise of the ultimate predators. Then, the Doctor and Victoria attend a garden party. But their genial hostess, Mrs. De Winter, is convinced that the garden conceals a secret. The hidden truth can be glimpsed by people less accustomed to the mask of politeness and cake. People like Jamie. And people like Leela, the mysterious "warrior of the Seventeen." The TARDIS has arrived in France in the fourteenth century a time of devastation and despair. In an empty church beside a crowded graveyard, Zoe meets a woman who claims to see a dreadful future waiting for the world. In the rain swept jungle of Belize, Captain Ruth Matheson and Zoe Heriot are both about to discover just what sacrifices they are prepared to make when faced with a seventeenth century threat that might just spell death for millions of innocent people. Does the end justify the means? Sometimes winning feels like exactly like losing..